Riassunto: This volume provides a unique and valuable contribution to our understanding of the impact of stressful life events and mass trauma on the person, the culture and society in the course of the life span. It provides a comprehensive look at our psychological state of affairs at the beginning of the twenty-first century. There are several volumes that address some or most of these areas indivi- ally but this volume is unique in that it has brought together theoreticians, researchers and clinicians who address critical challenges in our lives. But we are now several months into the global financial crisis requiring a transition, not only for the western world but for the third world. How on earth do families in trauma zones – from Sri Lanka to Afghanistan, New Orleans to Gaza – cope with similar declining older relatives, with added traumas and zero medical resources attempt to survive? In news reports, politicians and financiers denying the inevitable and struggling for solutions that cannot be relevant to the new reality that they have yet to discover. "From theory to practice, the Handbook of Stressful Transitions Across the Lifespan takes the reader from the process of recognition to the challenge of helping clients understand and adjust to stress-induced changes in their lives. Its thirty four well-organized chapters exhaustively cover the spectrum of human experience. Each addresses the nature of personal transitions and the distortions that stress introduces to normal development over the lifespan. It is a very helpful book, and it belongs in your collection." "The Handbook of Stressful Transitions Across the Lifespan, a multidisciplinary and international volume, is well founded in neurobiological and psycho-social theory elaborating on the stressful transitions occurring throughout life. It is unique in addressing not only life threatening transitions in health and illness, but legal, ethical and financial transitions, as well as those related to education and career. The Handbook further examines the issues surrounding marriage, family, and sexual transitions as well as the cultural, religious and spiritual transitions experienced through life experiences. It is noteworthy that directions for the future are provided to the reader by Handbook’s exploration of the impact of genetic testing, survival of stressful transitions, and examination of post traumatic growth required by humans in order to adapt and accommodate to life successfully. The Handbook provides practical guidance to the reader for meeting these challenging needs of their clients. 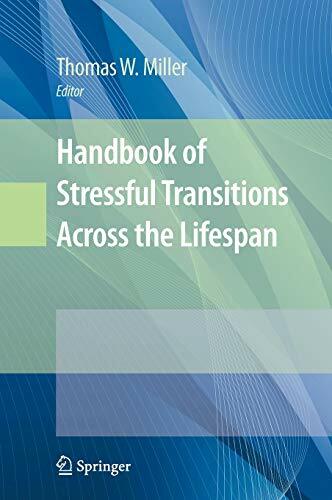 The "Handbook of Stressful Transitions Across the Lifespan" is an exceptional multidisciplinary volume, which provides it's readers with an authoritative "one stop" resource for acquiring a comprehensive understanding of the impact of stress across the life cycle. Drawing from a range of international perspectives and scientific disciplines, this collection masterfully succeeds in combining breadth of scope with richness of detail by exploring life transitions through a variety of personal, theoretical, and clinical lenses. Whether working at the bench or the bedside, this handbook will prove invaluable to a wide cross section of professionals working in the fields of medicine, psychology, counseling, and education. "The Handbook of stressful transitions across the lifespan is a substantial tome. The Handbook is directed at both practitioners and researchers. A rich mixture indeed! It builds on the editor’s earlier series of publications on stressful life events (Miller 1989, 1996, 1997, 1998). Overall, it is Erik Erikson’s theory of lifespan development that receives most detailed attention, including Clark’s pschobiographical analysis. Weitzel writes eloquently and unsentimentally about his experience of Parkinson’s disease. Then, three of the five authors of a chapter on the aftermath of unexpected traumatic change recount – in one case with the assistance of another of the authors - their experience of living through serious, sudden and unexpected trauma. Williams’ chapter focuses specifically on what he terms transition psychology, which he uses to consider and indeed predict responses to, amongst other things, mass traumas such as natural disasters and terrorist attacks. You will find chapters that are primarily scholarly discussions and overviews - including Lacković-Grgin and Penezić’s (chapter 22) on self-regulation and Wheeler’s (chapter 26) on African-centered spirituality and its role of in facilitating transition. Elsewhere, there is discussion of more narrowly defined or practically-oriented topics – including nutrition (Ilich and Brownbill, chapter 31), animal and animal-assisted therapy (Adams, chapter 32), the role of humour (Kuhn, Nichols and Belew, chapter 33), and the need for financial planning (Boardmann, chapter 15). In the best tradition of Handbooks, such variety leads readers into new and varied fields of inquiry. I do have a few minor quibbles. I was surprised to see no mention of Erikson’s ‘ninth stage’ (Erikson, 1997), or of the associated theorizing and research on gerotranscendence (for example, Tornstam, 2005). But these criticisms are small beer. Whilst this is not perhaps a book to be read cover-to-cover, it is certainly a book to be consulted, mined and returned to. Miller’s Handbook of stressful transitions across the lifespan is undoubtedly a wide ranging and valuable reference text."